The TRUFA Communications Committee is planning the next phase in our “Fair Funding for TRU” campaign. As you’ll recall, the first phase focused on lobbying local Members of the Legislative Assembly. Phase Two will involve a direct appeal to the Minister of Advanced Education, and will make the case that the outdated funding formula from the Ministry, by recognizing neither TRU’s status as a University nor our legislative requirement to meet the educational and training needs of our region, has led to chronic underfunding and under-resourcing of front-line educational programs. 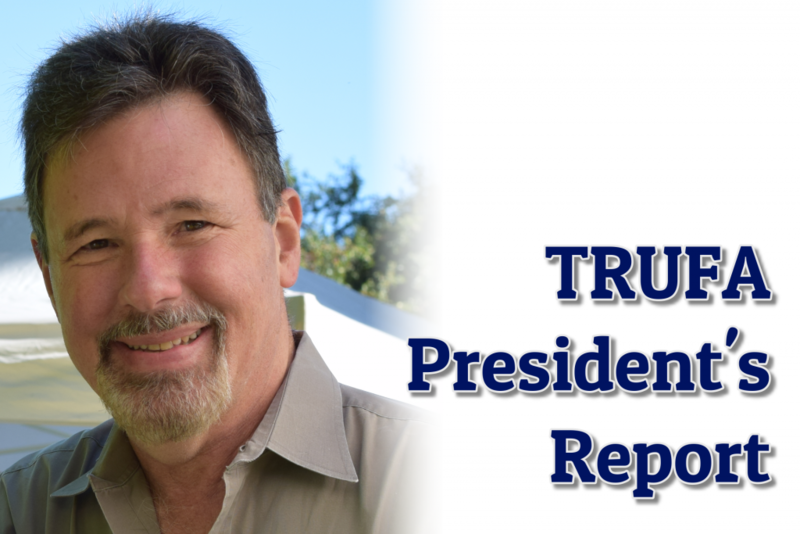 A website will be up-and-running in the New Year educating TRU and the broader community about the need for the Ministry to review and revise the funding formula to meet the needs of our two campuses and the many communities in our region that need TRU services. In addition, the website will allow for automatic e-mail messages to be sent to the Minister in advance of the February BC provincial budget. On December 6th, TRUFA Table Officers met with TRU senior administrators—AVP Academic, Dean of Nursing, AVP Human Resources and Director, Human Resources—to discuss issues of mutual concern. In addition to the issues I indicated in my report in the November newsletter—changes to EI benefits for faculty who take maternity leave, selection of interim/acting Associate Deans and Deans, revisions to Adventure Studies pay rates for Mountain and Ski Guide programs, and academic decisions affecting Williams Lake campus—the parties also spoke about obligations of faculty members between the end of the Fall semester and the beginning of the Winter semester. 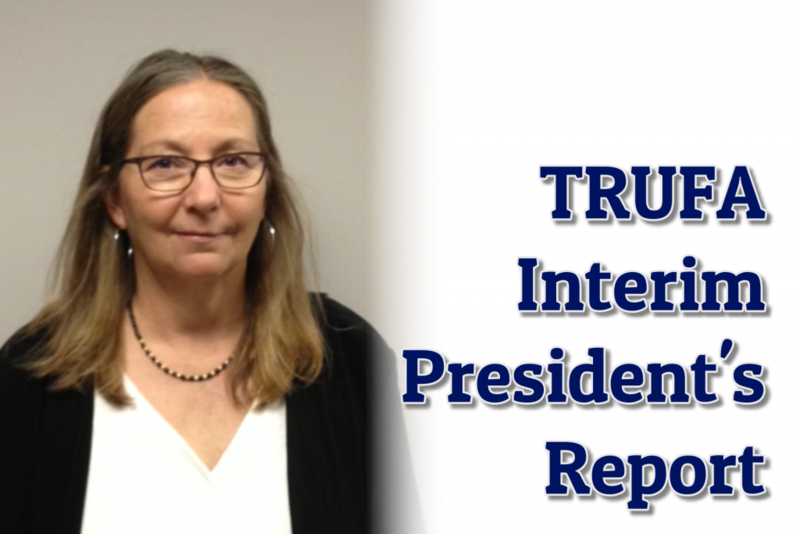 TRUFA and TRU admin will be making a joint presentation to the Committee of Chairs in January, reminding departments that faculty have important service obligations between semesters. Unless faculty declare that they are taking vacation days, they are expected to be available for departmental service activities during this period. On November 30th / December 1st, TRUFA VP Star Mahara and I travelled to the Williams Lake campus and met with a number of our TRUFA members. Williams Lake programs and faculty find themselves in a difficult situation when it comes to academic oversight and decision-making. While Williams Lake faculty belong to departments and Faculties/Schools, they are often subject to decisions that do not always take into account local conditions in the South Cariboo, and oversight is often conducted—not by department Chairs or relevant Deans—but by local Williams Lake administrators who don’t necessarily have the knowledge or experience to ‘manage’ academic programs. A Williams Lake Faculty Council was formed two years ago to act as the collective voice of Williams Lake faculty members. The Council made a comprehensive proposal to the Provost one year ago, recommending that on-the-ground academic leadership be implemented to address this problem. To date, Williams Lake Faculty Council have not had the opportunity to meet with the Provost and discuss these issues in person. TRUFA will continue to advocate for an academic governance model that preserves departmental autonomy but allows for decisions/oversight to be conducted in response to local conditions. The Long-Term Service Award was presented to retiring EML faculty member, Barbara Bearman. The Academic Governance Award was presented to Faculty Council Chair, Kathy Lauriente. On behalf of the TRUFA Executive and our stellar office staff—Confidential Administrative Assistant, Marian Griffin, and Communications Assistant, Martha Solomon, I want to wish you a very joyous and relaxing holiday season.